Gonzalez Byass UK are proud to announce the arrival of The London Gin, one of a handful of super premium Gin's actually distilled in London. Quadruple distilled in small batches under the careful eye of Master Distiller Charles Maxwell, The London Gin is made from the highest quality English grain spirit and contains with 13 key botanicals. To the traditional juniper, coriander and angelica are added lemon peel, cassia bar, liquorice, cinnamon, almond, angelica, savory, orris root and orange root. It also uniquely contains gardenia and bergamot - that instantly recognisable perfumed aroma most often encountered in Earl Grey tea. The pot still method of production ensures that only small batches of London Gin are produced at any one time, ensuring a constant quality threshold. 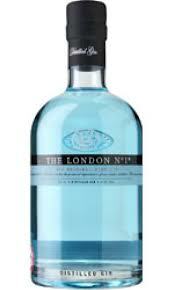 The London Gin also presents itself with a turquoise-blue hue - 'The Original Blue Gin'. At a generous 47% abv The London Gin is delicate and elegant on the nose with marked spicy and balsamic notes. Soft, elegant and mellow on the palate, The London Gin gives way to a long finish with refreshing acidity, all of which adds up to a sophisticated, well rounded gin that delivers in every area.